Public safety is the first priority for any event. Residents are always reminded to have a 72 hour Emergency Kit available and to download the Alberta Emergency Alert app onto their mobile devices. The Sage Creek fire is now classified as being held. The evacuation alert that was in effect for the MD of Pincher Creek has been rescinded. The Area closure put into effect by Alberta Parks has been lifted. A complete fire ban remains in effect for the MD of Pincher Creek and the Town of Pincher Creek. Residents are encouraged to use the links provided on the MD website to monitor the fires in the area. The MD of Pincher Creek will continue to be vigilant in monitoring surrounding areas and remain in communication with our partners. Communication will be provided to residents if the situation changes, at this time there will be no further scheduled updates. The Sage Creek Fire remains within the Province of BC and has not crossed the border into the MD of Pincher Creek No. 9. This wildfire is 85% contained and has not experienced any significant fire growth since August 16. Any changes in size since then have been the result of more accurate mapping, the current estimated size is 2007 hectares. The area received 5-10 millimeters of rain last night. Resources on the fire include 106 firefighters, 11 helicopters and 2 air tankers. The Area Closure put in by Alberta Parks will be lifted as of 1800hrs today. The Evacuation Alert is still in effect for residents of Castle Mountain Resort, the West Castle Valley, South Castle Valley and all areas South of Highway 774 from the end of the pavement. A map of the area is available on our website here. The Town of Pincher Creek is NOT included in the evacuation alert. Please note: Beaver Mines Lake Campground, Camp Impeesa, and Syncline Group Camp are NOT included in this closure. Smoke continues to be visible in the area from multiple fires. A precautionary air quality advisory remains in effect for Southwest Alberta. REMO (Regional Emergency Management Organization) will continue to monitor the situation and receive daily updates from Alberta Wildfire and informational updates will continue to be provided to residents daily. Have a 72-hour emergency kit available. Information on how to build a kit is available here. An Evacuation Guide is available here. Residents are strongly encouraged to check that their fire insurance is up to date. Residents are strongly encouraged to download the Alberta Emergency Alert app. Instructions can be found here. Residents with livestock adjacent to southeast section of Castle Wildland Park should continue to be aware of the fire status and check official information sources regularly. A document on preparing your livestock for evacuation is available on the MD website here. Residents are encouraged to monitor official information channels to ensure accurate information. Should you have questions, please call 1-855-627-5365 to leave a message. The Sage Creek Fire remains within the Province of BC and has not crossed the border into the MD of Pincher Creek No. 9. This wildfire is 65% contained and has not experienced any significant fire growth since August 16. Any changes in size since then have been the result of more accurate mapping. In the next 24 hours, the wildfire will remain active within its current perimeter with no growth expected. Resources on the Sage Creek fire include 107 firefighters, 11 helicopters, and 2 air tankers. This fire is burning in remote terrain. hot and dry weather, wildfires can change rapidly. Residents are reminded to remain vigilant, as wildfires are unpredictable and this situation could change with minimal notice. Resources on the Sage Creek fire include 106 firefighters, 13 helicopters, and 2 air tankers. This fire is burning in remote terrain. Crews are working to reinforce the Flathead Sage Forest Service Road as a guard on the north end of the fire. The south side of the fire is burning upslope and connecting with the fuel break created from the Kenow Mountain wildfire from 2017. Crews and equipment made good progress along the perimeter. Bucketing and airtanker drops continued in priority areas. Crews will continue to work the line with pump and hose supported by helicopter bucketing. Aerial suppression will continue to limit further spread along the perimeter. The Evacuation Alert is still in effect for residents of Castle Mountain Resort, the West Castle Valley, South Castle Valley and all areas South of Highway 774 from the end of the pavement. The Sage Creek Fire remains within the Province of BC and has not crossed the border into the MD of Pincher Creek No. 9. The estimated size of the fire is 1947 hectares. With increasingly hot and dry weather, wildfires can change rapidly. Residents are reminded to remain vigilant, as wildfires are unpredictable and this situation could change with minimal notice. Resources on the Sage Creek fire include 109 firefighters, 10 helicopters, and 2 air tankers. This fire is burning in remote terrain. Crews are working to reinforce the Flathead Sage Forest Service Road as a guard on the north end of the fire. The south side of the fire is burning upslope and connecting with the fuel break created from the Kenow Mountain wildfire from 2017. Crews and equipment made good progress along the perimeter. Bucketing and air tanker drops continued in priority areas. Crews will continue to work the line with pump and hose supported by helicopter bucketing; aerial suppression will continue to limit further spread along the perimeter. 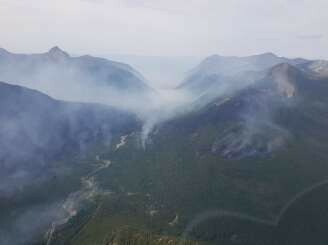 The Sage Creek Fire remains within the Province of BC and has not crossed the border into the MD of Pincher Creek No. 9. The estimated size of the fire is 1947 hectares. Residents are reminded to remain vigilant, as wildfires are unpredictable and this situation could change with minimal notice. Resources on the Sage Creek fire include; 86 personnel, 12 helicopters, and 2 air tankers. The Sage Creek fire continues to burn in remote terrain. Crews will continue to work the line with pump and hose supported by helicopter bucketing; areal suppression will continue to limit further spread along the perimeter. The Sage Creek fire remains in the Province of B.C. and has not entered Alberta. There was no fire area growth overnight and the fire remains estimated at 1936 hectares. Residents are reminded to remain vigilant, as wildfires are unpredictable and this situation could change with minimal notice. Environment Canada predicts a weather forecast for the next few days as hot, with slight windy conditions. Rain is expected on Sunday. Resources on the Sage Creek fire include; 102 firefighters, 12 helicopters, 3 heavy equipment and 2 air tankers. The Sage Creek fire continues to burn in remote terrain. Crews are working to reinforce the Flathead Sage Forest Service Road as a guard on the north of the fire. The Sage Creek fire remains in the Province of B.C. and has not entered Alberta. There was no fire area growth overnight and the fire remains estimated at 1936 hectares. The Sage Creek Fire remains in the Province of British Columbia. It has increased in size and is now 1843 hectares. The fire continues to burn in remote terrain, which is challenging to the crew. Fire suppression resources include 108 firefighters, 8 helicopters, 3 heavy equipment and 2 air tankers. Crews and equipment continue to build guard on the east and west sides of fire along perimeter. Bucketing and airtanker drops continued in priority areas. Heavy equipment will continue constructing dozer lines. Crews will provide support with pump and hose; sprinkler line to be set up on east flank. Aerial suppression will continue to limit further spread along the north perimeter. At the request of the Sage Creek Incident Command Team, fire structure protection equipment (sprinklers) has been placed at Castle Mountain Resort, with more equipment arriving on standby. A complete fire ban is in effect for Fire Control Zones in areas 1, 2 & 3. Also, a complete fire ban is in effect for the MD of Pincher Creek and the Town of Pincher Creek. An Evacuation Alert is still in effect for residents of Castle Mountain Resort, the West Castle Valley, South Castle Valley and all areas South of Highway 774 from the gravel. A map of the area is available on the MD's website. Residents are strongly encouraged to have an evacuation plan in place, and be prepared to evacuate with an hours’ notice. If possible, evacuate early. Residents choosing to leave are requested to call 1-855-627-5365 and leave a message, including name, contact number, number in the party and legal land description. Highway 774 remains open. Information is posted at the turnoff to Beaver Mines Lake Road, regarding the alert. Please note: Beaver Mines Lake Campground, Camp Impesa, and Syncline Group Camp are NOT included in this closure. Residents with livestock adjacent to the Southeast section of Castle Wildland Park should continue to be aware of the fire status and check official information sources regularly. A document on preparing your livestock for evacuation is available on the MD website here. It is recommended that residents have a 72-hour emergency kit available, in the event of evacuations. Information on how to build a kit is available here. An Evacuation Guide is available here. Residents are strongly encouraged to check that their fire insurance is up to date. Residents are strongly encouraged to download the Alberta Emergency Alert app. Instructions can be found at www.emergencyalert.alberta.ca/content/about/signup.html. The Emergency Operations Centre (EOC), has reactivated for communication and coordination between agencies. REMO continues to monitor the situation and receive daily updates from Alberta Wildfire and informational updates will continue to be provided daily. Residents are encouraged to monitor official information channels to ensure accurate information. Should you have any questions, please call 1-855-627-5365 to leave a message. The Sage Creek Fire remains in the Province of British Columbia. It has increased in size and is now 1445 hectares in size. The fire is burning in remote terrain, which is challenging to the crew. Fire suppression resources include 102 firefighters, 8 helicopters, 3 heavy equipment and 2 air tankers. Crews and equipment continued to build guard on the east and west sides of fire along perimeter. Bucketing and airtanker drops continued in priority areas. Heavy equipment will continue constructing dozer lines. Crews will provide support with pump and hose; sprinkler line to be set up on east flank. Aerial suppression will continue to limit further spread along the north perimeter. Ignition sites to be identified. An Evacuation Alert is still in effect for residents of Castle Mountain Resort, the West Castle Valley, South Castle Valley and all areas South of Highway 774 from the gravel. A map of the area is available on our website. Highway 774 remains open. A checkpoint is placed along Highway 774 at the turnoff to Beaver Mines Lake Road, with informational signage posted regarding the alert. A fire restriction remains in place for the Calgary Forest Protection Area. A complete fire ban is in place for the MD of Pincher Creek and the Town of Pincher Creek. West Castle Valley to the east and south of Castle Mountain Resort (Castle Mountain is NOT under an evacuation alert at this time). This proactive closure is being put in place due to the remote nature of the back country area, and difficulty it would present to evacuate in an emergency wildfire situation. There will be a checkpoint along Highway 774 at Suicide Creek, the highway remains open to the Castle Mountain Resort. This Area Closure has been put into effect under the authority of Section 17 of the Provincial Parks Act. For further information on this Area Closure, visit AB Parks website. A complete fire ban has been issued for the MD and Town of Pincher Creek. The fire hazard has increased to the point where any fire may become large. All fire permits in the MD of Pincher Creek and the Town of Pincher Creek are suspended until conditions improve. The fire is burning in remote terrain, which is challenging to the crew. Fire suppression resources are still actively fighting the fire. These resources include 69 firefighters, 8 helicopters, heavy equipment and 1 air tanker. The south side of the fire is burning up slope and connecting with the fuel break from the Kenow Mountain wildfire. The Sage Creek Fire remains within the Province of British Columbia. There has been small growth to the fire. Conditions are predicted to remain hot and dry for the next 24 hours. The Sage Creek Fire has not reached the Alberta border. It has not increased in size, and is approximately 1148 hectares. Fire suppression resources, between both BC Wildfire and AB Wildfire, include 69 firefighters, 8 helicopters, heavy equipment and 1 air tanker. The fire is burning in remote terrain. The south side of the fire is burning up slope and connecting with the fuel break from the Kenow Mountain wildfire. The hot weather that is forecasted may provide challenges to the suppression crews. Heavy equipment will continue constructing dozer lines and crews will support with pump and hose. Aerial suppression will continue to limit further spread along the perimeter. The Sage Creek Fire has not reached the Alberta border. It has not increased in size, and remains at 1239 hectares. Fire suppression resources, between both BC Wildfire and AB Wildfire, include 68 firefighters, 7 helicopters, heavy equipment and 2 air tankers. The south side of the fire continues to burn upslope and connecting with the fuel break created from the Kenow Mountain wildfire from 2017. Heavy equipment will continue constructing dozer lines and crews will provide support with pump and hose. Aerial suppression will continue to limit further spread along the perimeter. The Sage Creek Fire has not reached the Alberta border. It has not increased in size, and remains at 1239 hectares. There are no evacuations alerts or notices in place. Fire suppression activity is still in full force from both BC Wildfire and AB Wildfire. AB Wildfire had 41 personnel, 4 helicopters, and 2 air tankers on site today, with 18 additional personnel arriving tomorrow. The Sage Creek fire is located in the province of B.C. and is approximately 1239 hectares in size. The Regional Emergency Management Organization (REMO) established a level one Emergency Operations Centre (EOC) on August 2, 2018. Situation update meetings continue to happen daily to ensure plans are in place if the fire enters Alberta, and that current and accurate information is being shared. In the next 24 hours Wildfire Alberta will take command of the fire. Today, air support from Alberta as well as additional air support from B.C. actioned the northern aspect of the burn. The winds today were light and southeastern aiding in a reduction in fire behaviour. An update will be provided on the BC Wildfire Service early afternoon daily, for a detailed description on how to check this website please click here. Updates will be provided if and when the situation changes, the next scheduled update will be early evening on August 6, 2018. Residents are encouraged to monitor official information channels to ensure accurate information. The Sage Creek Fire is 1238 hectares in size, it is located approximately 2.5-3 kilometers southwest of the Alberta-BC border. The fire has not crossed the Alberta border. activities. A dozer group is located within the Castle Area, with additional resources available if the fire moves into Alberta. well as the front canyons from the national park boundary north to Whitney Creek. While there are no closures in effect at this time, the nature of wildfires are unpredictable and sudden changes may place these park areas at risk. A precautionary air quality advisory remains in effect for Southwest Alberta. Residents with livestock adjacent to the Southeast section of Castle Wildland Park should continue to be aware of the fire status and check official information sources regularly. We would like to remind residents that the MD of Pincher Creek always recommends residents to have a 72-hour emergency kit available. Information on how to build a kit is available here. Updates will be provided if and when the situation changes, an additional update will be provided early this evening. Residents are encouraged to monitor official information channels to ensure accurate information. The Sage Creek Fire is 1238 hectares in size, and is located approximately 2.5 - 3 kilometers south west of the Alberta ­ B.C. border. The fire is still burning towards the fuel break created from the Kenow Mountain wildfire from 2017, with a portion of the fire burning North of Sage Creek. The B.C. Wildfire Service continues to actively fight the fire, using ground crews with heavy equipment, as well as air support. Alberta Wildfire personnel were also onsite today to assist with the firefighting activities. Commencing in the morning, Sunday, August 5, 2018, a Type 2 Alberta Wildfire team will be fully briefed of the situation and will be assuming the management of the Sage Creek Fire, within the next 48 hours. A dozer group is located within the Castle Area, with additional resources available, if the fire moves into Alberta. This fire is not presenting an immediate threat to the Castle Parks, but is being closely monitored by Alberta Environment and Parks and their partners (Alberta Agriculture and Forestry, MD of Pincher Creek, RCMP, Pincher Creek Emergency Management Commission). Plans are in place to protect public safety within the park. Park users are asked to avoid the backcountry areas in the South Castle Valley, West Castle Valley (beyond the Castle Mountain Resort), as well as the front canyons from the national park boundary north to Whitney Creek. While there are no closures in effect at this time, the nature of wildfires are unpredictable and sudden changes may place these park areas at risk. The overnight weather forecast predicts a 60% chance of showers. Temperatures tomorrow are forecasted to reach 23 degrees, with a 30% chance of showers. Winds will be southwest at 20 km/h by mid-afternoon. Smoke will continue to be highly visible in the M.D of Pincher Creek. A precautionary air quality advisory remains in effect for Southwest Alberta. Residents with livestock adjacent to the Southeast section of Castle Wildland Park should continue to be aware of the fire status and check official information sources regularly. We would like to remind residents that the MD of Pincher Creek always recommends residents to have a 72-hour emergency kit available. Information on how to build a kit is available here. Updates will be provided if and when the situation changes. Residents are encouraged to monitor official information channels to ensure accurate information. Smoke is causing locally poor air quality and reduced visibility. Conditions continue to vary in the Waterton Lakes area. Any showers in the area should alleviate the smoke temporarily. The chance of showers is forecast for the remainder of the weekend. However, conditions are expected to return to poor in the Waterton Lakes area early next week as the Sage Creek fire continues to burn. During a wildfire, smoke conditions can change quickly over short distances and can vary considerably hour-by-hour. The fire that we had been previously referring to as the Wise Creek Fire is now referred to as the Sage Creek Fire (N12024) for consistency. This fire is located approximately 6 kilometers south west of the Alberta – B.C. border. The B.C. Wildfire Service is actively fighting the fire and will continue to use air support throughout the day. The fire continues to burn upslope and is predicted to connect with the fuel break created from the Kenow Mountain wildfire from 2017. This fire is producing a large column of smoke that is highly visible in the M.D of Pincher Creek. A precautionary air quality advisory remains in effect for Southwest Alberta. Alberta Parks is recommending that visitors to the Castle Region stay mobile and in close proximately to their campsites. Alberta Parks is recommending that backcountry travel be postponed in the Castle Wildland and Provincial Parks. The fire that we had been previously referring to as the Wise Creek Fire will now be referred to as the Sage Creek Fire (N12024) for consistency. This fire is located approximately 6 kilometers southwest of the Alberta – B.C. border. The fire is currently active and approximately 1016 hectares in size. The B.C. Wildfire Service is currently utilizing a modified response, meaning they are using a combination of suppression techniques, including direct and indirect attack, and monitoring to steer, contain and otherwise manage fire activity within pre-determined perimeters. B.C. Wildfire ground crews and heavy equipment were on site today along with aviation support. The south side of the fire is burning upslope and connecting with the fuel break created from the Kenow Mountain wildfire from 2017. Alberta Wildfire Service has a Type 2 team on stand-by and a dozer group is located at the Gap, also on stand-by. Additional resources are in our area and are available, if the fire moves into Alberta. Residents with livestock adjacent to the Southeast section of Castle Wildland Park should stay aware of the fire status and check official information sources regularly. The Wise Creek Fire is currently burning in B.C. and has not entered the province of Alberta, the fire is approximately 120 hectares. An Alberta fire suppression team is on stand-by with suppression equipment should the fire enter the Province of Alberta. Trigger points are being identified and closely monitored by the EOC for voluntary and mandatory evacuations. At this time, no evacuation notices have been issued. A reduction in the smoke thickness from the fire has been observed in parts of the MD this morning. Winds are projected to slightly increase during the day which will most likely cause smoke to stay in higher elevations. Smoke plums will most likely be visible from multiple locations in the MD of Pincher Creek. A precautionary air quality advisory has been issued from Alberta Health Services for Southwest Alberta, for information on this advisory please click here. A forest fire, now being called the Wise Creek Fire (N12024), is currently burning in British Columbia (BC). At the time of this update, the fire has not entered Alberta. The fire is now approximately 100 hectares. A level one, Emergency Operations Centre (EOC) has been established by the Regional Emergency Management Organizations with assistance from Alberta Parks and the RCMP. The situation is being closely monitored by the municipality, Government of Alberta and Government of B.C. A fire growth model and assessment is currently being conducted by B.C. officials and officials from Alberta Agriculture and Forestry. At this time, there are no evacuation alerts or advisories. The wind is forecasted to decrease overnight and we are anticipating that smoke will settle into low areas. Visibility in areas may be reduced. Residents with health concerns should keep windows closed. Please watch www.albertahealthservices.ca/news/air.aspx for updates on air quality advisors. If there are no major changes to the situation, another update can be expected midmorning, on August 3, 2018. Please be advised that if the situation changes additional updates WILL be provided via our official communication methods. Communication can be expected via Alberta Emergency Alert, www.mdpinchercreek.ab.ca , www.facebook.com/MdPincherCreek, www.twitter.com/md_of_pc. We would like to encourage residents to obtain information from official resources. Columbia, South of Highway 3. Smoke is visible from the SouthWest corner of the municipality. The Alberta Ag and Forestry is in contact with the BC Government, due to the close proximity of the fire to the Alberta border. The Municipal Emergency Operations Centre has been activated, and is in communication with Alberta Ag and Forestry, and is monitoring the situation, and receiving updates as they become available. Residents with smoke sensitivities are requested to take proper precautionary measures to avoid exposure, such as keeping windows closed and remaining inside. . The wind is forecasted to decrease overnight and we are anticipating that smoke will settle into low areas. Visibility in areas may be reduced. Residents with health concerns should keep windows closed. Please watch www.albertahealthservices.ca/news for updates on air quality advisors. Residents with smoke sensitivities are requested to take proper precautionary measures to avoid exposure, such as keeping windows closed and remaining inside.